When preparing to do battle in Evony, countless gamers unfortunately put very little consideration into what their plan of attack is or how they expect to win. Not surprisingly, these players are seldom victorious and lack what's necessary to every become an Evony world power. By dedicating some time to prepare for your attack, you can save yourself a significant amount of trouble that would normally arise and can greatly increase your chances of victory. The first task when preparing for combat is simply to choose an appropriate valley to attack. This is an extremely vital stage of preparation, and should not be neglected. For one thing, you must decide upon a target whose protection isn't so great that there is no way you could possibly win. If you decide to attack a level ten NPC, for instance, you must have a powerful army or else there is no chance that you will possibly be able to win. It’s also necessary to avoid choosing a very low leveled city, however, as the plunder simply will not be worth the losses. Not only will you likely lose more units than the amount of plunder that you gain, but you will also be sacrificing precious time that could be better spent attacking more worthy enemies. Another imperative stage of preparation is scouting your enemy before attacking them. Numerous players often skip this step, presuming it is not important, while in reality, it is one of the most significant things you can do to increase your chances of victory. If you don’t spend time scouting your opponent before attacking them, you will have no idea what units their army is made of, and have very little assurance of coming out victorious. Thus, spending the time to scout out your opponent is also critical for success. Next, put together your army accordingly, based on what the scout report revealed about your opponent's defenses. 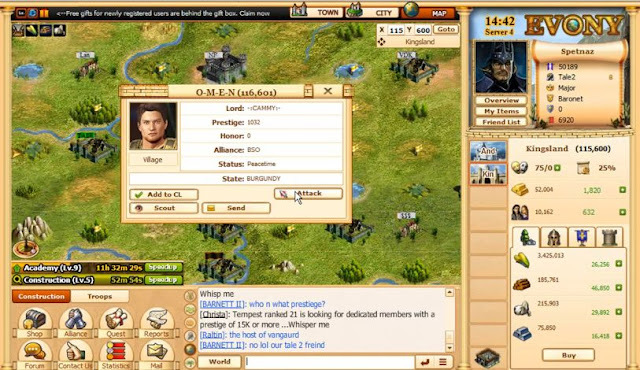 Most players simply assemble as many total units as they can and attack each different target with the exact same arrangement of troops, putting very little thought into whether or not their troops correspond well with the opponent's defenses. For example, if you are attacking an enemy NPC city who does not have any trebuchets, an excellent idea would be to bring ballista. If you're attacking a city that contains a huge number of abatis, a good tactic would be to hold back your cavalry and replace them with other types of units. Using your cavalry may slightly increase your strength, but you will forfeit so many cavalry to the abatis, you will definitely lose too many to ever justify such a decision. Regrettably, most players neglect to consider these things when attacking, and their success suffers considerably because of it. Lastly, dismiss your units in waves. Sending off your army in waves works much better than sending a massive force just one time, and should be the approach you use for best results. Also, make sure to bring plenty of transports in order to bring back resources to your city. Few things are worse than putting forth the time and effort to defeat a city, only to have the resources stolen by another gamer because you neglected to bring ample transports. By spending time planning out your attacks, you' will notice that you become significantly more successful during Evony combat.